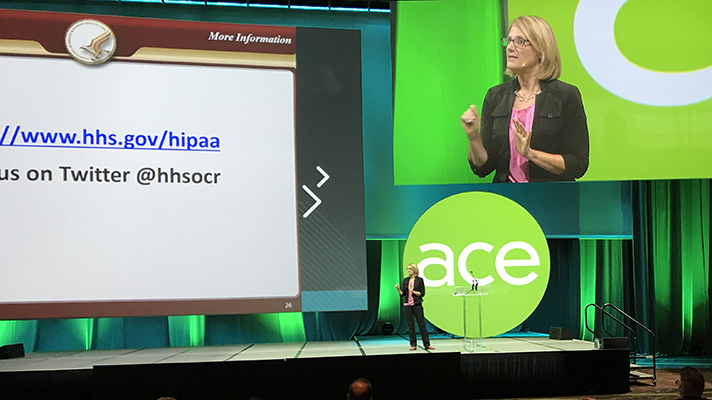 Don’t let that audit turn into a deeper investigation, Deven McGraw said at the Allscripts user conference in Chicago. CHICAGO -- Almost every breach case that Health and Human Services investigates begins with a hospital having failed to perform a risk analysis, according to Deven McGraw, deputy director for health information privacy for the HHS Office for Civil Rights. Then it follows that they failed to manage and identify risk or, in many instances, conducted a risk analysis indicating what needs to be done, but then that just sits on a shelf gathering dust. McGraw pointed to common mistakes that can turn an audit into a compliance review, including not having clear business associate agreements in place and failing to report a breach within 60 days of discovery, as well as the aforementioned lack of risk analysis and subsequent action. Between September 2009 and June 2017, healthcare organizations reported 1,982 large breaches of protected health information to the federal government, and the number of individuals affected by breaches is approaching 200 million, McGraw added. McGraw also reminded attendees about the details of reporting a breach, and that a breach must be reported as soon as possible and no later than 60 days after it’s discovered. But she pointed out that the HIPAA rule stresses as soon as possible, and that 60 days is not the optional window. Complaints by individuals can trigger an investigation by the OCR. The office has had just shy of 160,000 complaints since 2009. A complaint could potentially trigger an audit. The purpose of an audit is to allow OCR to take a look at what a healthcare organization is doing from a compliance perspective, outside the context of a formal investigation. The surest way to go from an audit to an enforcement review is not to respond to an audit notification, McGraw warned healthcare organizations. In most cases, entities are able to demonstrate satisfactory compliance through voluntary cooperation, and maybe there are a few suggestions OCR has for corrective action.